Trending at $56.95eBay determines this price through a machine learned model of the product's sale prices within the last 90 days. 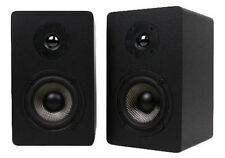 Used & Fully Tested - 100% Working - Micca MB42 75 Watt 2-Way Bookshelf Speaker Pair Black No Grills . In addition to smooth and natural vocals, the 8" woofer is capable of robust bass output. Perfect integration between the tweeter and woofer is achieved through a 6dB crossover network. Perfect integration between the tweeter and woofer is achieved through a 6dB crossover network. 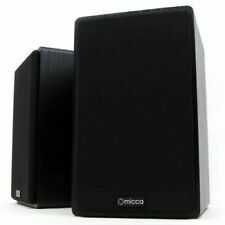 Micca MB42 2.0-Channel Bookshelf Speaker (REFURBISHED) BNIB. Condition is New. Shipped with USPS Priority Mail. 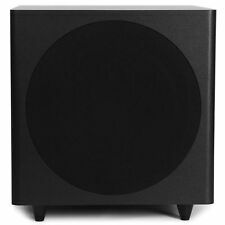 Nothing else quite so dramatically improve the impact and dynamics of a sound system like a good subwoofer. Its robustly built long throw driver uses a treated pulp paper cone that is lightweight, rigid, and resonance free. Condition is Used. Micca Club 3 Specifications Power Handling: 75 Watts (Each). Sensitivity: 83dB 1W/1M. Impedance: 4-8 Ohms. Frequency Response: 55Hz-20kHz (Typical In-Room). I added the Micca crossovers to make them the MB42X. They were used as rear surrounds for about 8-9 months once a week. I would consider them in "LIKE NEW" condition. 2 Way In Wall Speaker 6.5 Inch Micca M-s6. Shipped with USPS Priority Mail. The COVO-S is shielded and can be safely used near older CRT TVs. Speaker Type : Subwoofers, Bookshelf. Built using patented concentric driver design, the COVO-S's audio performance results from a balanced application of sophisticated drivers, enclosure tuning, and crossover construction. Manufacturer: Micca. In addition to smooth and natural vocals, the 8" woofer is capable of robust bass output. Perfect integration between the tweeter and woofer is achieved through a 6dB crossover network. The Micca MB42 bookshelf speakers render an amazing listening experience while taking up very little in space or budget. Micca MB42 Bookshelf Speakers. Note: MB42 speakers are not self-powered and require an amplifier or receiver to play music. New open box. Please see pictures for the condition and the exact item you will be receiving. Perfect integration between the tweeter and woofer is achieved through a 12dB crossover network. Smooth and natural sound signature with clean bass output for impactful listening experience. New in original boxed, opened for inspection, but never actually used. Balanced Woven carbon fiber woofer for enhanced transient and impactful bass. IMPORTANT: The MB42 is a passive speaker and needs to be used with an amplifier or receiver. It cannot be connected directly to a turntable! The COVO-S is shielded. Built using patented concentric driver design, the COVO-S’s audio performance results from a balanced application of sophisticated drivers, enclosure tuning, and crossover construction. Micca M-6S 6.5-Inch In-Wall/Ceiling Speaker. Shipped with USPS Priority Mail. 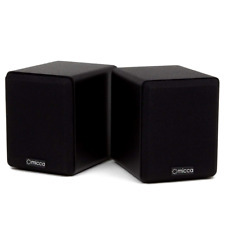 YOU ARE BIDDING ON ONE MICCA MB42 BOOKSHELF SPEAKER PAIR W CARBON FIBER WOOFERS/SILK DOME TWEETERS. This is a used speaker pair that have some minor surface marks and signs of use. There's a small hole in the grill fabric of one but otherwsie they're in good used condition and both work. This is your chance to save big-time so don't miss out!. The Micca MB42X builds on the success of the sensational Mb42 by significantly raising the performance bar while still taking up very little space and budget. New for the MB42X is a highly optimized 12dB crossover with Zobel network and baffle step compensation. Vinyl black wood grain finish (as opposed to the vinyl black matte finish found on the 'X' models) makes these unique. Barely used, new condition, in original boxes with manuals, etc. Nice speakers. Sound tested perfect with all good drivers. 2-way bass reflex 8 ohms, 75 watts. Very nice set of performance speakers. Micca MB42 Bookshelf Speakers with High End 4-Inch Carbon Fiber Woofers below and Silk Dome Tweeters on the top. These are a fine example of small speakers with great sound. They measure only 9 3/8" tall X 5 3/4" wide X 6 1/2" front to back. The pair weighs 8 1/2 pounds unpacked. They sound fantastic for there size. Minor wear and tear as shown in photos. Please ask if unsure. micca motion series mb42 bookshelf speakers pair . Condition is New, unused. I never figured out how to connect them. They’ve been collecting dust. See cord attachment in photo. Shipped with USPS Priority Mail. The COVO-S is shielded. Built using patented concentric driver design, the COVO-S audio performance results from a balanced application of sophisticated drivers, enclosure tuning, and crossover construction. Perfect integration between the tweeter and woofer is achieved through a 12dB crossover network with a compensation network. Smooth and natural sound signature with clean bass output for impactful listening experience. The COVO-S is shielded. Built using patented concentric driver design, the COVO-S's audio performance results from a balanced application of sophisticated drivers, enclosure tuning, and crossover construction. Versatile and Affordable Hearing is believing. Place the MB42X-C directly above or below the TV and tilt it towards the listener for best results. They can also be used vertically in a pair as bookshelf speakers. Perfect integration between the tweeter and woofer is achieved through a 6dB crossover network. Smooth and natural sound signature with robust bass output for impactful listening experience. We will try to answer within 24 houres. Perfect integration between the tweeter and woofer is achieved through a 6dB crossover network with a compensation network. Perfect integration between the tweeter and woofer is achieved through a 6dB crossover network with a compensation network.